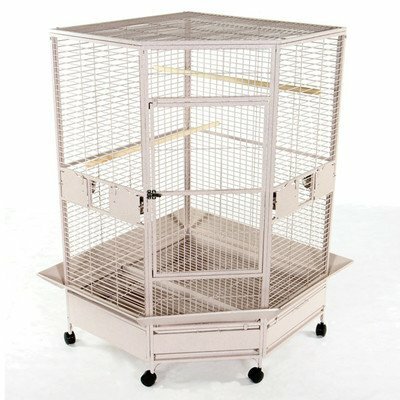 What is the Best Corner Bird Cage for Sale? If you’re looking to save space inside your home then a corner bird cage will be ideal for you. It’s unique, angular design allows the cage to fit perfectly into any corner of your room, thus freeing up living space. Plus with 2 walls on each side of the cage, your birds will feel more protected as they are not left out in the open. However, compared with normal bird cages, corner cages tend to be larger and thus provide more room for your birds. Which factors make a good corner bird cage? 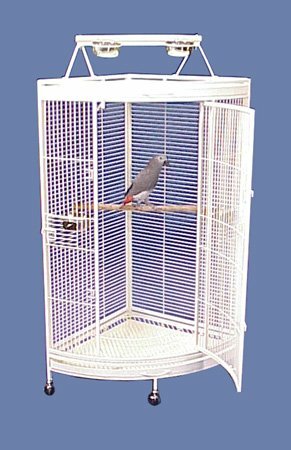 Pretty much all corner bird cages are medium to large sized and so will fit any medium to larger sized birds. However, if you’re planning on housing smaller sized birds then you might want to check the bar spacing of the cage. Smaller birds such as budgies or finches might be able to fit through the gaps of larger cages. You want at a maximum the bar spacing to be 1/2″ and no more if you’re housing smaller birds. 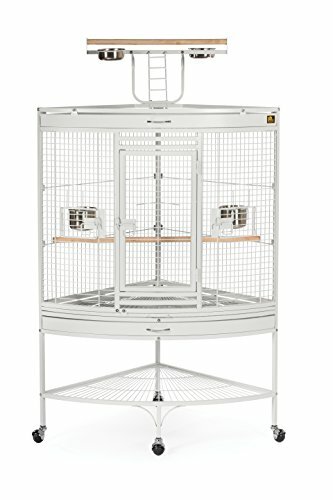 If you’re housing 2 or more large birds such as cockatoos then consider the large corner bird cages such as the A and E Corner Cage. The more space you can provide your birds with the better. Corner cages tend to be higher priced than normal cages because of their unique design and because they offer more space. So you will need a bigger budget and if the cage isn’t fully furnished then you’ll need to budget in for any extra accessories that you purchase. As a general price guide, smaller and lower end corner cages cost around $250 to $350 whereas larger higher end ones typically range from $500-$750. Whilst size is a major determining factor, internal & external features are also important. For example, the 3156W from Prevue is fully furnished and even comes with a play top which is a great additional feature for your birds. Other internal factors you want to look at are the number of perches used, how many watering and feeding trays there are plus if there are any internal climbing ladders. Removable trays will make cleaning the waste from your bird cage a lot easier. Also, small accessible doors on the side of the cage (next to the feeding and watering trays) will make taking care of your birds more convenient. 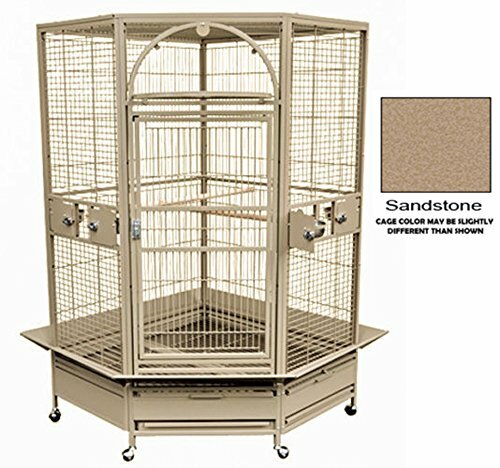 All corner cages typically come with wheels so they can be moved around your home and every door on these types of cages will comes with a lock. This should be padlocked with a key if you have children and don’t want them interfering with your birds. There are a number of materials that are bird safe and then there a number which aren’t, so check what your cage is made out of. Unsafe metals include brass, copper, lead, tin and zinc. Safe bird metals include aluminium, iron and stainless steel. Galvanized steel is a bit more complicated. If it’s galvanized steel before welding then it is less safe. Galvanized steel after welding however is safe. What’s more, look at the paint that is used. Remember that powder coated paint provides the safest protection from birds as it’s hard for them to consume any paint flecks when it is applied this way. 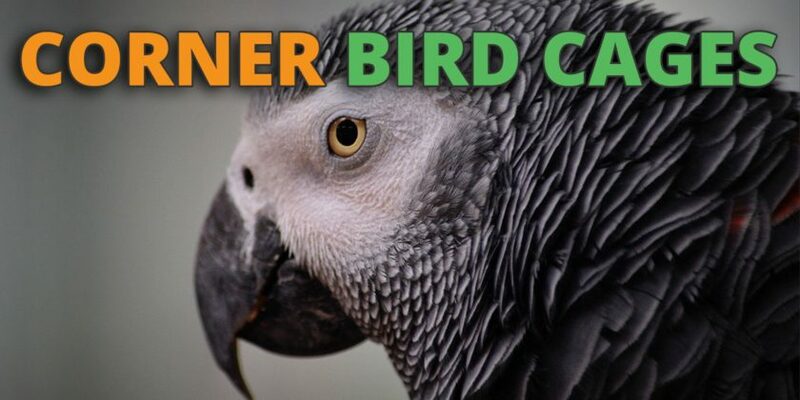 We’ve reviewed some of the best corner bird cages for sale. We looked at how easy the cages are to use, the price range, the quality of the materials used and how well the inside of the cage is furnished. From this we uncovered the largest and cheapest corner bird cages available. Playtop will keep your birds entertained for hours. Very affordable for a King’s Cage. Bottom tray allows for extra storage. 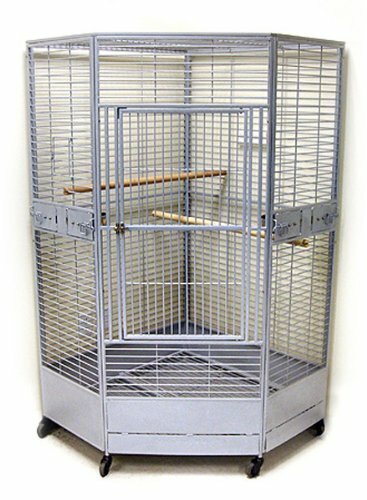 One of the most popular corner bird cages available, it’s made from sturdy materials and has all of the possible internal furnishings you could need. The main drawback to this cage is that the setup might require some figuring out and the cage doesn’t arrive in the best packaging. Inside: X2 removable trays, 4 swing out feeding/watering trays, 2 perches, front grill with safety latch. Made from top quality materials which are secure and solid. Easy to assembly but might require 2 people. Floor guards prevent waste from hitting the floor. An extra large corner cage that will provide your birds with far more space than the standard cage. A higher end cage that provides higher quality craftsmanship. Provides enough space for most large birds. Lot’s of safety locks and features to prevent your birds from escaping. Some user’s reported issues with the quality of the materials and latches. Other user’s report issues with items arriving broken. The Kapoho Kave II comes with all of the features that a corner cage would need and is available in 2 different sizes to match your needs. However, some user’s have reported a few issues with the cage. Inside: 4 swing out doors for feeding and watering trays, removable cleaning tray, 1 wood perches, front door with bird proof locking system. Straightforward instructions so the cage is easy to put together. Enough space to accommodate most bird species. If any issues arise there’s good customer service. Comes with an additional playtop. Some user’s report that the wire is too thin or check your species of bird. Others don’t like the lack of skirting to prevent mess. The additional playtop and the extra height on the Honolulu provides extra points to the cage. A well built standard corner bird cage. The best quality and well made corner bird cage on the market. Huge size and well furnished. Comes in a range of different beautiful colors. You get what you pay for. This King’s Cage is the best corner cage available and is for those that are looking for a premium solution. Attachable bird corner shelves can provide a great additional platform for your pets to rest upon. Both metallic and wooden versions of these platforms are available. If you have a larger sized bird with a strong beak then stick to the metal version of these platforms to prevent them from being chewed. Simple corner perches are also available that will attach with screws to 2 sides of your cage. These perches are padded and can be easily installed and moved around the cage. Corner cups, feeding trays and watering stations are available which are right angle shaped so they can fit into the corner of the cage. These are soft bits of fabric that you can attach to the corners of your cage and allow your birds to rest on a smooth, comfortable piece of material. Helps to protect them from drafts and keeps them warm. Some people inquire about buying secondhand or used bird cages and we always recommend against it. If you really want to buy a used cage then you can from places such as Ebay, Gumtree or Craiglist but it’s a risky choice. When buying secondhand, you simply don’t know what paints and toxic chemicals might have been used on the cage. Plus if you don’t know the model of the cage then it will be difficult to assess which materials the cage is made of and these could potentially be toxic. Also, you won’t have a warranty or guarantee so if anything breaks, you’re on your own.